Once they were saved, the only thing left to do was to tell others that they were sinners and needed salvation. There was no vision for Christian behavior in the world. This assignment would then lead into a two-week discussion comparing a two act narrative (Sin –> Salvation) with a more faithful narrative (Creation –> Fall –> Redemption). We took the time to work through the richness of Genesis 1-2 and its implications for being human, knowing God, relating to creation, relating to one another, developing culture, playing sports, pursuing vocation, etc. Students were stunned at what we discovered. Then we worked through the call and purpose of Israel and why the Old Testament is even there. Again, students were happily shocked at what they found. 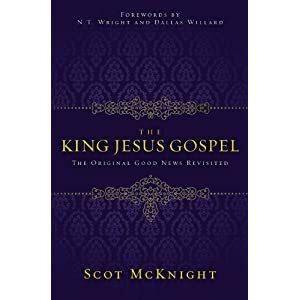 They were amazed that the Bible had a coherent narrative that made Jesus, the early church, and living as Christian people today make good sense. I stated a few weeks ago that I believed that evangelicals are largely ignorant of the biblical gospel. I’ve seen it first-hand. I have found that evangelicals generally reflect the same ignorance of the Bible as Scot’s and my undergraduates. They are living with a truncated version of the Scriptural narrative. They have shrunk down the nature of theology, their understanding of God, the character of salvation, and the content of Scripture to a single formula that starts in the wrong place, renders irrelevant about 80 percent of the Bible, and has no discernible Christian social outlook. One of the wonderfully salutary effects of N. T. Wright’s many works over the last few decades is to re-orient evangelicals according to the narrative of Scripture. Many other scholars have contributed, such as Chris Wright and the works by Craig Bartholomew and Michael Goheen. I think Scot has diagnosed the problem well and is pointing in several redemptive directions. I’m looking forward to seeing how he develops some of his solutions as I make my way through his book. Yes, I like the works by Craig Bartholomew and Michael Goheen, Christopher Wright, and Tom Wright – and your The Drama of Ephesians! “Once they were saved, the only thing left to do was to tell others that they were sinners and needed salvation. There was no vision for Christian behavior in the world.” When I reflect on the way I was raised in hyper-fundamentalism, I concur that this is the case. When you couple this with the notion most evangelicals have that Genesis 1 & 2 is ONLY an argument against evolution instead of a beautiful picture of human purpose within God’s creative plan, is it any wonder that so many Christians have a truncated view of the Gospel? A great post – would love to see more on this. I would add another act: Creation, Fall, Redemption…and Glorification. Of course, the fourth act is significantly different from “We go to heaven.” Once the first three are solidly in place, we can better see in Revelation that the New Jerusalem comes to earth. The story of the Bible is about “God with us” all the way through from the garden to our wanderings in the desert, from the cross to the City of God. Thank you I really apprecited this article (thanks Siufung for telling me). Hays, too, has helped open our eyes to the narrative of scripture. Tim, I agree with your assessment that evangelical Christianity seems to have a misunderstanding of the gospel. I’m curious as to what you give these students as an alternative to “we’re all sinners and we stand in need of salvation” or “we have all offended a perfectly holy God and need Christ to have our sins forgiven” or “God created the world perfect but we rebelled against him and now stand in need of salvation”? I’m not sure I see a clear “nutshell” presentation of your own view of the gospel in either of your posts regarding this problem. Hey Brad, the assignment was designed to draw out into the open how our students had their vision of the biblical narrative shaped by the typical “plan of salvation” — a boiled down and truncated summary of “how to get saved.” Over the generations, this “plan” had come to shape the way they viewed the entire Scriptural story so that they had left out key aspects of it. So, it wasn’t at all my aim to replace their synopsis with another synopsis, but to begin to reconstruct their understanding of being Christian, the biblical narrative, etc. And it was indeed something more along the lines you’ve laid out. In fact, in thinking about their possibly discussing the gospel at some future point with a person, it was our aim to give them a greater familiarity with the Bible so that they could draw upon any aspect of the Scriptures and “the gospel” in order to meet the need of the moment. After all, the gospel is not simply a boiled-down formula.